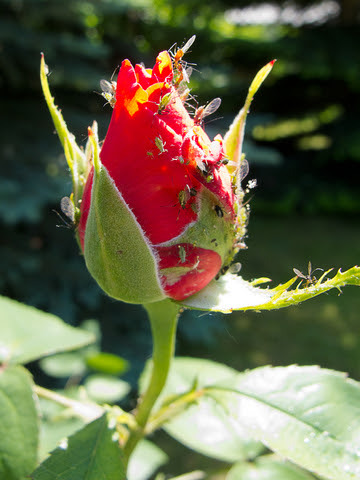 Keep an eye open for caterpillars, greenfly and red spider mites. If you’re still in the mood for planting why not put in some flag irises in a dry, sunny spot, for another splash of colour? Bees and butterflies will be attracted to a border planted up with achillea, Buddleia, campanula, cat mint and sedum. Make a herb garden with lavender, rosemary, thyme and oregano. Add sage, fennel and chives and put mint into pots sunk into the ground to stop it spreading everywhere. Sow annual parsley for autumn. Lift and divide daffodil clumps that have been in the ground for some years before they go ‘blind’ and no longer flower. Dry and store the bulbs for planting in late August or September or simply replant. You can take cuttings of shrubs and herbaceous perennials for a continuous supply of young plants. There, you thought you were just going to relax. Why not? Admire your work. What a wonderful flower! I like roses. Thanks for this post.